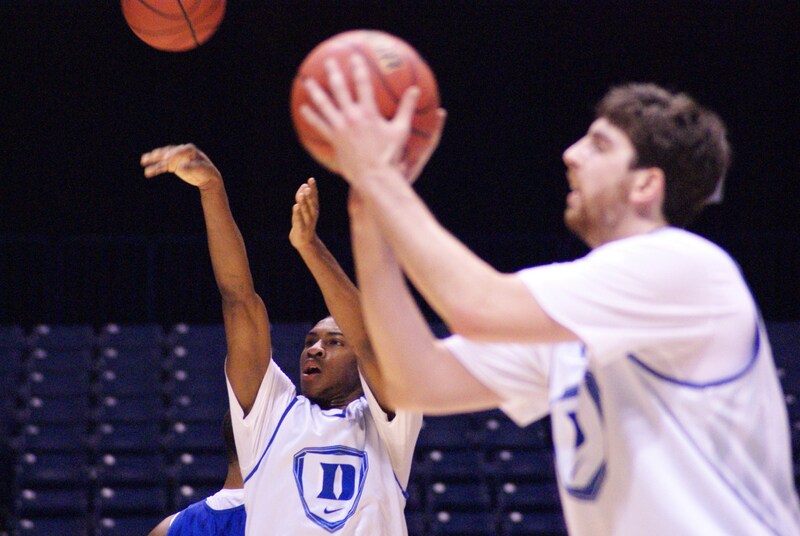 BDN caught up to Ryan Kelly during the opening day of the Coach K Academy in Durham where he shares his thoughts on his recent engagement and his goal to make it to the NBA. 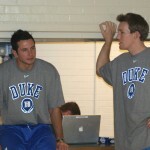 PHILADELPHIA, PA. - Going into Duke's round of 32 game against Creighton, the question came up about Duke's depth. Coach Mike Krzyzewski's predilection for a short post-season rotation is well known, but did this year's Duke team have bench players who could step up if needed? 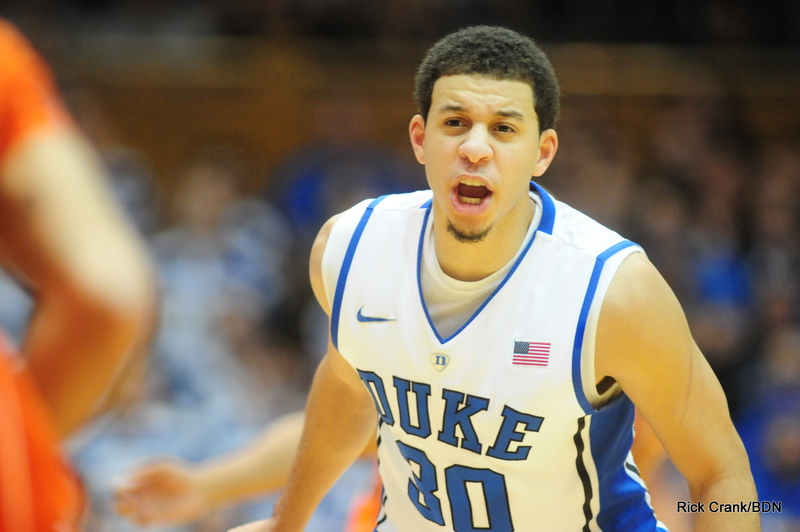 "Yep, we have enough guys," Duke assistant coach Jeff Capel said. "And we've proven that all year. Guys have stepped up and done a good job. You know we had a crisis in the middle of the year when Ryan went out, and not many teams have had a guy that's that important that's gone out and that's missed that many games, and we had guys that stepped up during that time. So if it comes to that, we'll have guys that are ready to step up and help us." Boy, did it come to that. Duke's Ryan Kelly, who drew the assignment to guard Creighton's national player-of-the-year candidate Doug McDermott, was whistled for a foul 43 seconds into the contest, a harbinger of things to come. The game was billed as a matchup of two of the best five offenses in the country. Creighton led the nation in field goal percentage and three-point percentage this season, and was fifth in the country in assists per game (while also coming in tenth in the country in assist to turnover ratio). Pomeroy rated the Blue Jays as the fifth most efficient offense in the land, while Duke ranked third. "They're very difficult to guard," Capel said before the game. "They put a lot of pressure on your defense, with how well they execute, with their talent, and with how well they shoot the ball." And the linchpin of that offense was Doug McDermott. Kelly hounded him for eight and half minutes, forcing the Creighton star to miss four of his first five shots, but the Duke forward drew his second foul with 11:29 to play in the first half and took a seat on the bench. Josh Hairston came in to check McDermott but fouled him on his very first possession thereafter. Less than a minute later, Mason Plumlee picked up his second foul. Kelly checked back in but couldn't challenge McDermott inside. The Creighton forward began to get hot, hitting three of four shots and adding a couple of free throws. Creighton inched into the lead. With 3:19 to play in the half, Kelly helped on a driving Austin Chatman and picked up his third foul. Duke fans let out a collective groan. Freshman Amile Jefferson, who gave up 30 pounds to McDermott and who'd played a mere eleven minutes in Duke's previous three games, came off the bench for Kelly. "All I wanted to do was come in with tremendous energy and try to use my length," Jefferson said. Creighton led, 21 to 20, when Jefferson entered the contest. It looked like Duke would have a challenge just keeping the game close until intermission. Except that's not how it worked out. Rasheed Sulaimon hit a key three pointer with 2:47 to go in the half, giving the freshman a Duke-leading ten points and giving Duke a two point lead. McDermott and Seth Curry each hit two free throws, and then Curry stripped McDermott of the ball with 53 seconds remaining in the opening period. Krzyzewski called a timeout. Instead of milking the clock, Duke went for a "two for one," attempting a quick score in the hope of getting the last possession of the half. It worked. Sulaimon was fouled on a drive and hit one of two free throws. Jefferson and junior reserve Josh Hairston checked in. Jefferson stuck to McDermott like Gorilla Glue, not allowing him a look at the basket. Creighton's Jahenns Manigat forced up a prayer three point attempt as the shot clock expired. Hairston ripped down the rebound and outletted to fellow bench player Tyler Thornton, who hit an off-balance three at the buzzer to give Duke a six point lead at the half, 29 to 23. 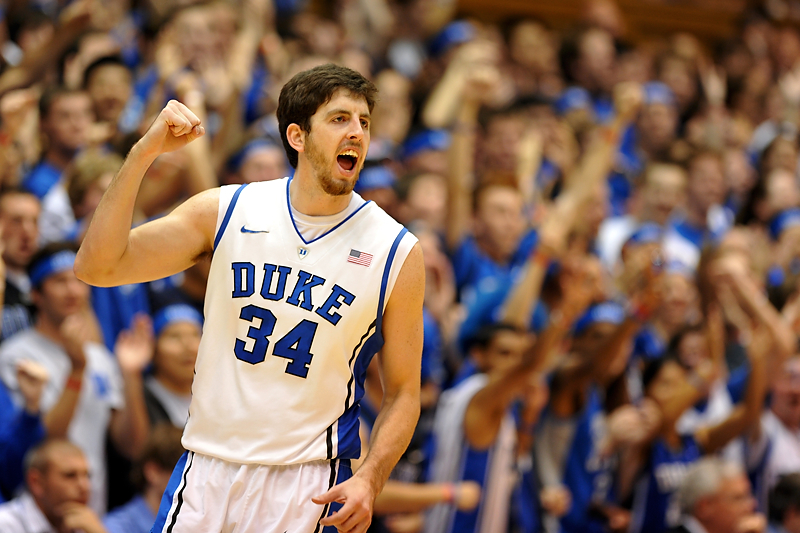 With Kelly burdened by his three fouls, Duke opened the second period trying Mason Plumlee on McDermott. Plumlee picked up his own third foul just thirty seconds into the half and Kelly had to switch back onto the Creighton foul magnet. The experiment cost Duke dearly when Plumlee made contact with Creighton center Greg Echenique and was whistled for his fourth foul with 17:48 to go and Duke clinging to a 31 to 27 lead. Hairston re-entered the game but fouled McDermott and Creighton forward Ethan Wragge on consecutive plays. Now Mr. Hairston had four fouls as well. Kelly joined his frontcourt teammates by picking up his fourth with 13:25 to play. In the meantime, Seth Curry made a great cut and layup to give Duke a nine point edge, 39 to 30, but it certainly didn't feel secure with Duke's entire regular frontcourt rotation saddled with four fouls each. It was time for the reserves to shine. "Our bench came through for us," Krzyzewski said afterwards. "Tyler, Josh, and Amile were outstanding contributors for us tonight." Krzyzewski went out of his way to praise junior guard Tyler Thornton. "I really can't say enough about [Thornton] on the defensive end of the court tonight.... I especially thought Tyler helped us defensively in that second half when we were in all the foul trouble, when Amile and Josh were in, he was able to kind of orchestrate us and made the switch on top so McDermott didn't get it, and then he had to move a little more to get it. Communication was huge for us, and I thought Tyler was outstanding in getting us together and doing that." Indeed, Thornton made some big plays, including flying in for an acrobatic steal just seconds after Kelly's fourth foul and drawing a critical charge on McDermott with 3:20 to play. But the most unlikely contributions came from Amile Jefferson. He hit his only shot on a snazzy pick and roll play to give Duke a 43 to 32 lead, and then came up with a huge offensive rebound which led to a Curry layup maintaining Duke's cushion at 45-34. But more importantly he stuck with McDermott to the end, even snuffing one of the Creighton star's shots with just over nine minutes left in the contest. "I love playing defense," Jefferson said afterwards. "And it's something I've been working on in practice. Guarding a wing now, with Ryan back I've been able to do a lot of that. And just learning from all these seniors, I've been able to get better. It's been real fun." Hairston fouled out on the scramble after Jefferson's blocked shot, and Plumlee garnered his fifth with 2:45 to play. But Doug McDermott didn't hit a field goal after Jefferson checked in, late in the first half. "He's such an amazing player, it's tough," Jefferson said of McDermott. "He can shoot the ball, he's great off the dribble, he can post and he has great size. So I just wanted to try to bother him with my length and make him take tough, contested shots." And that he did. The Creighton star shot just 4 for 16 for the game (along with 12 free throws) for 21 inefficient points. It was enough to give Duke a 66-50 win and a ticket to the Sweet 16. "It's the best defense we've played all year," Krzyzewski said, noting communication is critical in games like this. "It was the best we talked on defense." -- Rasheed Sulaimon led Duke with 21 points on 5 for 9 shooting (3 for 5 from three), plus 8 for 10 from the line. -- Quinn Cook added 6 assists against 2 turnovers, giving him 17 assists and only 3 turnovers in the Philadelphia pod. That's an average of 8.5 apg and a 5.7 assist to turnover ratio. -- Seth Curry, playing on an injured leg with a short turnaround, started slowly, hitting only one of his seven first half shots. But he heated up in the second period, shooting 4 for 8 (2 for 5 on threes) in the last twenty minutes. Perhaps more importantly, his leg held up. "I felt great, for the most part," Curry said. 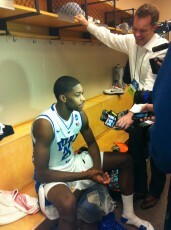 -- Philadelphia native Amile Jefferson enjoyed shining in front of his hometown fans. "I was tremendously excited about [coming home and playing in Philly]. I had my family here, a lot of friends, my AAU coach, my head coach, so it was really fun to be out there and see them cheering me on, once again, like it was back in the old days. So I was really happy about that." 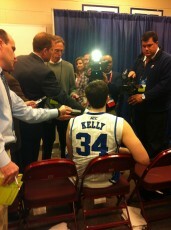 -- Ryan Kelly scored just 1 point, but Coach K praised him for his overall play. "I love that we won and [Ryan] scored one point.... He knows he played a heck of a game." -- This weekend's games marked the third time under Coach K that Duke has played NCAA tournament games in Philadelphia and Duke is 6-0 in those games. The two other seasons Duke played in the City of Brotherly Love? That would be 1992 and 2001. Here are our three post game videos from Duke Senior Night where the Blue Devils defeated Virginia Tech in Cameron. 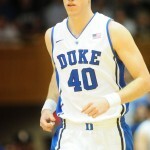 Check out post game comments from Mason Plumlee, Ryan Kelly and Seth Curry. 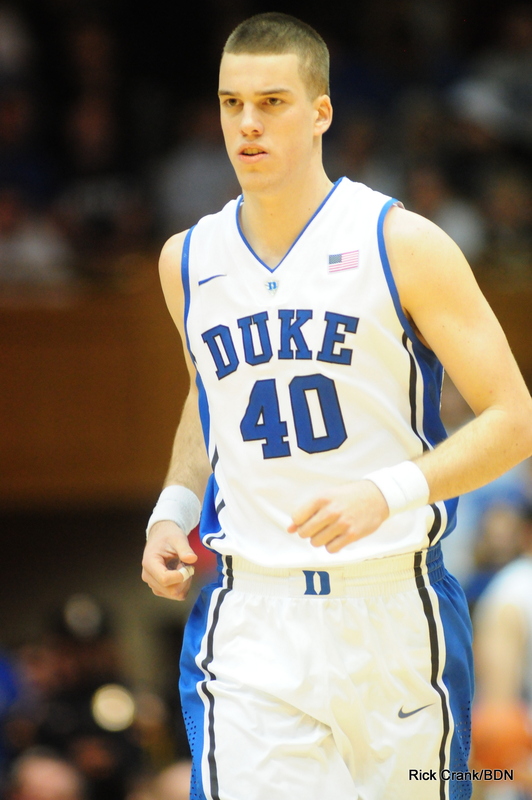 Marshall Plumlee is one of several Blue Devils who have an opportuinity to step their games up while Ryan Kelly is on the mend. Ryan Kelly is sitting out with ligament damage to his foot. First of all, there is no replacing Kelly, who has done a little bit of everything of late for the #1 ranked Blue Devils. His ability to stretch the floor with his three-point shooting and his help defense have been major factors in the Blue Devils undefeated start. But now, with the injury, it will be of the utmost importance for his teammates to step up their games moving forward. The tests start early when Duke travels to Raleigh to take on ACC pre-season favorite N.C. State on Saturday afternoon. The Wolfpack will likely go after Mason Plumlee in an attempt to neutralize his game with foul trouble, and to couple that with Kelly's absence to then take advantage of a lack of proven depth. So who will step up for the Blue Devils? It will be interesting to see what Coach Mike Kyzyzewski comes up with, especially knowing how affected Duke was when Kelly went out a year ago, the team fell out of sync, and was eventually upset by Lehigh in the NCAA Tournament. If past history means anything, what Coach Kwill likely do is dependent upon matchups. While Josh Hairston has been the sixth man to date off the bench and the first sub down low, you most certainly could see more of freshmen Alex Murphy, Amile Jefferson, and Marshall Plumlee. The three frosh have been brought along slowly this season, but now they will have to find a way to collectively fill the gap in production that usually comes from Ryan Kelly. Jefferson still has what I will term a freshman body, not quite ready for the grind of the ACC, but he's athletic and long enough to contribute. Murphy has had some trouble getting into the flow of the game in certain situations, but he too is capable of seizing the opportunity. The youngest Plumlee is still working into shape after a foot injury set him back, but his size could be a major need if his brother Mason goes to the bench with foul trouble. While most of the focus will be on those players, the staff also needs the other starters to step up their games. It will be crucial for point guard Quinn Cook to find players in their areas of strength on the offensive end. Mason Plumlee will need to shake a minor slump by his lofty standards, and it would be nice for Duke if Rasheed Sulaimon picks it up on the offensive end as well. Duke will also need consistency from Seth Curry and Tyler Thornton, especially against an N.C. State team that features solid back court play. 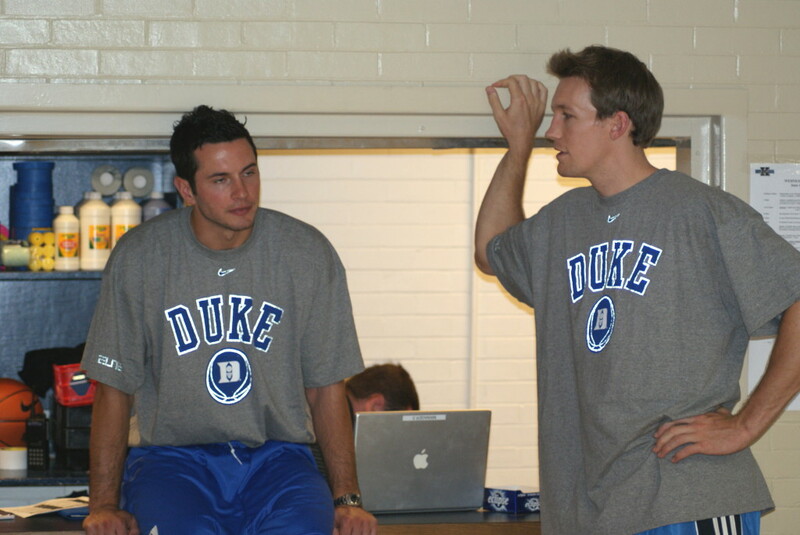 It's a sad situation, the Kelly injury, in that Duke to date has been a team with near perfect chemistry. This is not a team chock full of surefire superstars, but one that plays together as well as any team in the nation. The Blue Devils have filled the positions of injures players in the past, but those teams had a more seasoned cast to turn to, so it will to some degree be new ground this go round. Duke has been playing good basketball but they have yet to look as dominant as they were early on after the nine-day break and now they lost one of their three talented seniors for a substantial amount of time. Looking ahead at the schedule, Duke comes back home to face Georgia Tech before travelling to Miami in a game they will surely be tested in. They then face a big Maryland team at home before road games with Wake Forest and Florida State and then N.C. State again at home. Kelly could miss both games against N.C. State, a team most feel is their biggest competition for their goal of an ACC regular season title.